Peas are a cool weather crop. Plants prefer an abundant source of phosphorus and a ph of 6.0 or higher. Hot, dry conditions can affect yields. They prefer trellising for best growth and disease maintenance. Available in a four pack. All plants are certified organic. Select here for transplant information, pick up and order dates. Oregon Sugar Pod II produces 4 inch pods that are smooth, stringless and delicious. The plant is a dwarf variety that averages 24-30 inches tall and does not require trellising. Powdery mildew resistant. Cascadia produces juicy, thick walled 3 inch long pods. 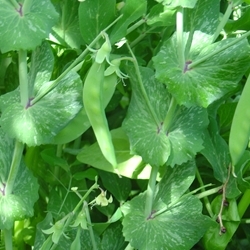 The pods get nice and plump with tiny delicious peas. Vines grow 3 feet tall. Multiple disease resistances.